Happy Fall!! We have officially entered one of my absolute favorite seasons. I am so ready for cooler weather, sweaters and cuddling up under blankets. This is also the season that seems to fly by!! So while this post may seem a little early… I put it together to make Fall entertaining easier on all of you. Basically a no brainer, so you can sit back and enjoy the season. Today I am showing you how to transition the same basic Fall items from a Spooky themed Halloween table setting to a beautifully chic Thanksgiving table by switching out a few key items. Fine on their own, here is how I would take them into Halloween. 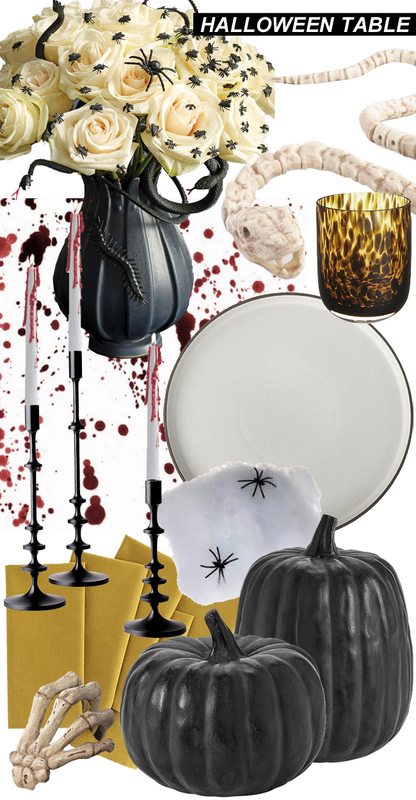 Start out with an inexpensive white sheet or tablecloth splatter painted in “blood” aka red paint. 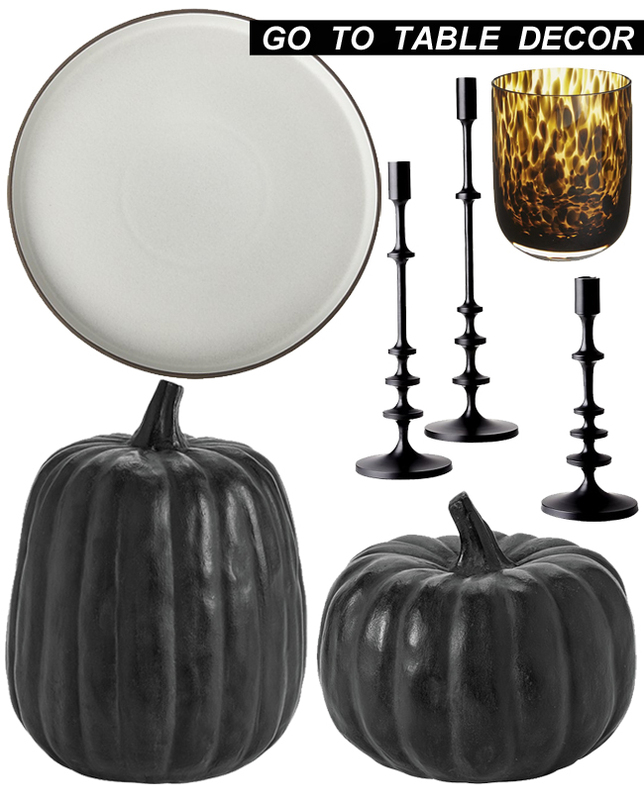 Run your matte black pumpkins down the center of your table and intermix your candlesticks creating multiple height layers. 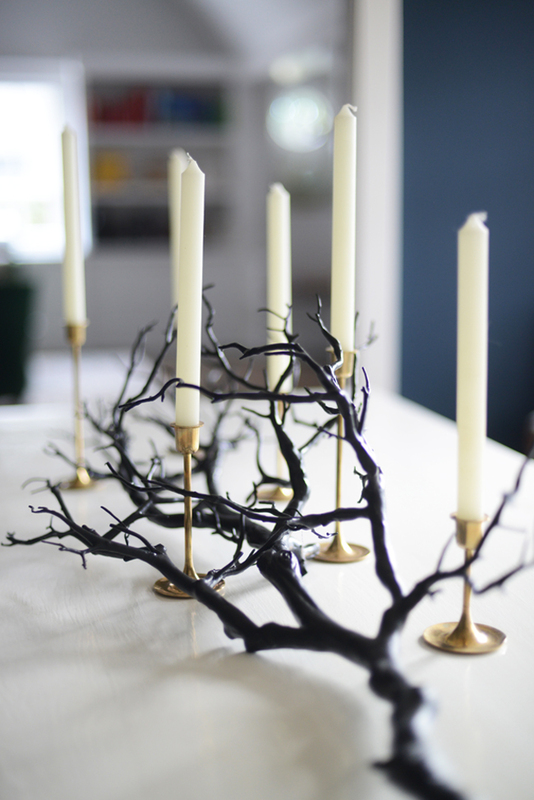 Add some bleeding candles to the candlesticks that start off as white tapers. When lit they appear to drip blood slowly as they burn. Not quite the black flame candle from Hocus Pocus, but still pretty great. Set out your plates and glasses as you would normally, and add a linen napkin… I choose the seasons go to color mustard. Slide them into these scary-chic skeleton hand napkin rings I found at Perigold. To reinforce the skeleton theme layer in a snake skeleton or a foot bone or two. All to keep your eyes moving around the table. And if you love florals, add some simple white flowers and add plastic spiders throughout the arrangement. This look is spooky while still feeling Halloween Chic. To take this look to Thanksgiving lets strip away the eerie elements and bring in some warmth. 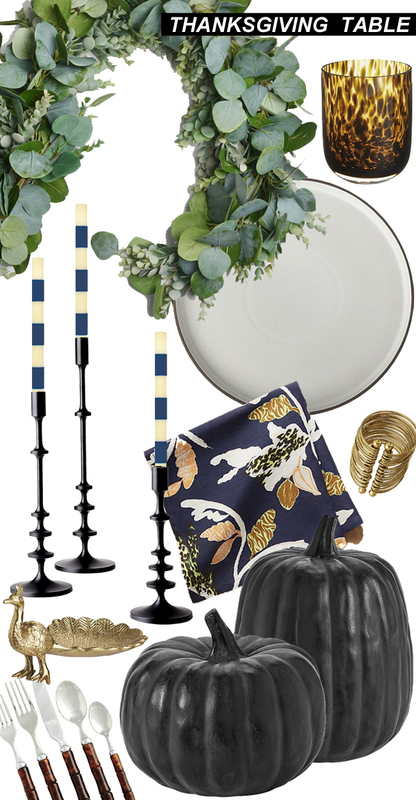 Keep your matte black terracotta pumpkins and candlesticks down the center of your table. We’ve in some fresh (or a good faux) greenery filled garland. Pop in some tapered candles like these striped beauties. The navy picks up the rich base color of these patterned napkins. A touch of metallic is brought in with the coiled napkin rings and a peacock spoonrest. Now that you have made your way through Halloween and Thanksgiving, lose the pumpkins and you could easily transition into the Christmas season as well. So rethink the items you already have and consider how you can take the same items from season to season.